Talk about an ambitious project, this is one of those under the radar programs that has been produced with a ton of care and thought. RPG manager isn't for a specific system, but what it does cater to is the GM/DM whom wants finite control over their world and what is in it. There are 2 distinct programs here; the Campaign Editor and the Game Manager. 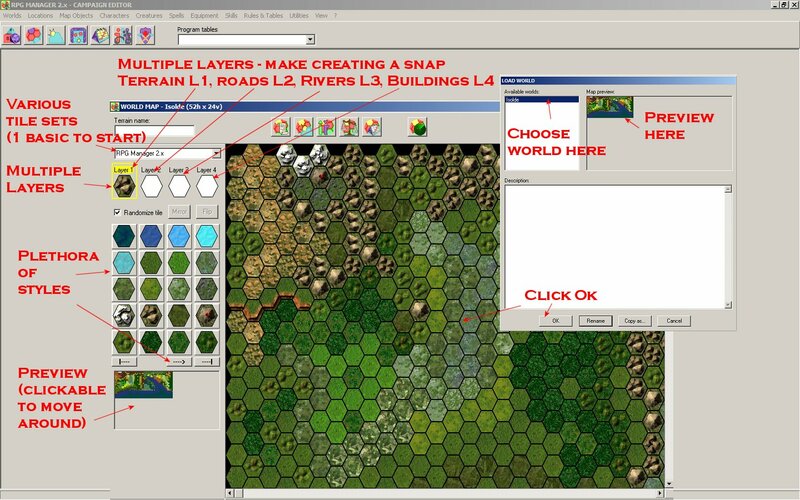 The Campaign Editor allows you to create world maps (with hexagonal tiles), local maps (both indoor and outdoor) with a square grid, and then link them to each other either via a hex on the world map, or via an image that you've saved. 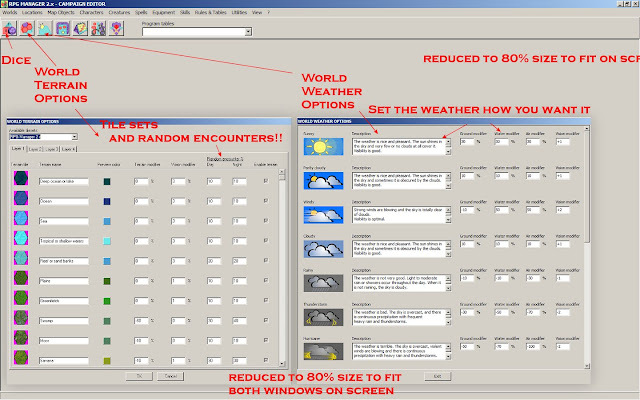 Don't overlook the capability of the world creator based on your previous experience with Hexagonal software. I've discovered it to be robust, and what makes it nice is how quick and simple you can create a map that is functional and works great. 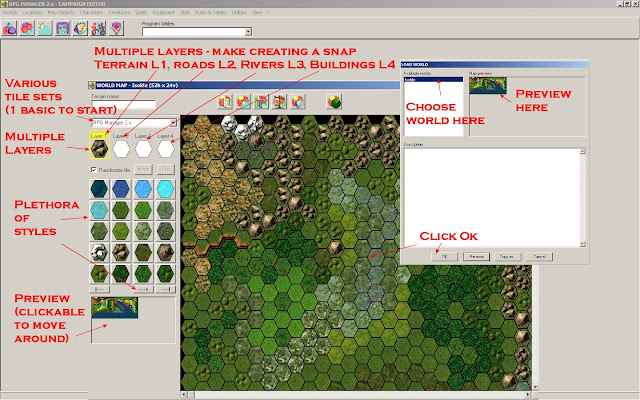 Layers offer ease of use, and each tile can be mirrored/flipped if need be, while there is a random tile placement system that handles multiples of the same type. 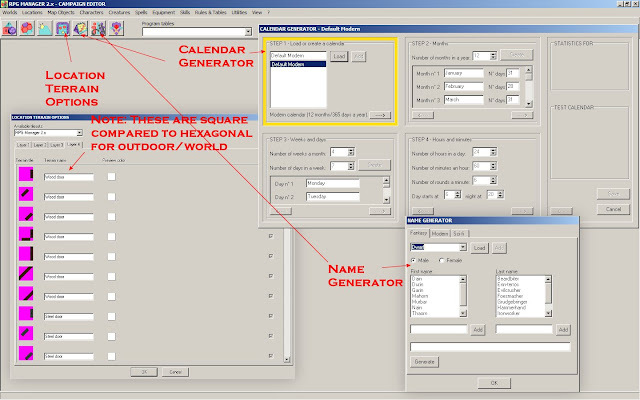 On top of this is the ability to set encounters/weather for each tile position, while it keeps the DM firmly locked into the creation process. Next is the various creator buttons. 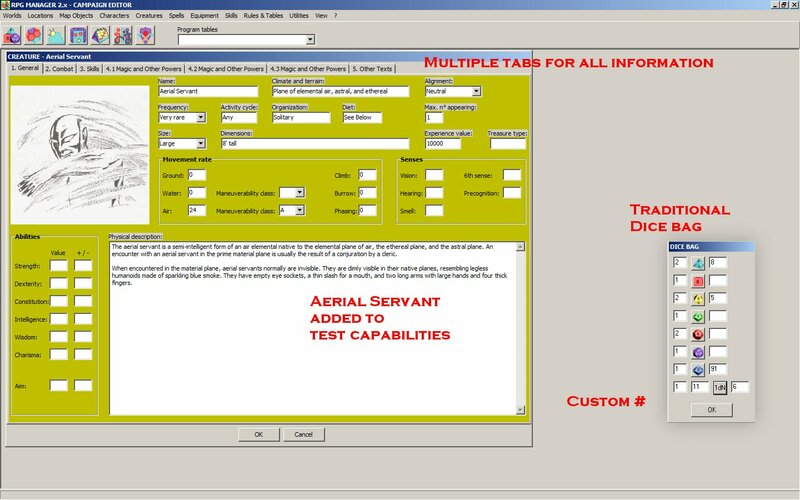 Adding a PC/NPC/Creature is a breeze, and while this software isn't AD&D specific I was able to quickly add in a 2nd Edition Aerial Servant and all his stats in just a few clicks. I like that the program will tell you if you've made an error (like forgetting to include # of attacks) and once its added to the library, when reopened it takes on a different color. Subtle things like this abound with RPG Manager, like when I clicked on my world map and decided to do an encounter table for a specific hex, up pops my Aerial Servant, and when I highlighted him, his image and base stats showed up. Excellent design! 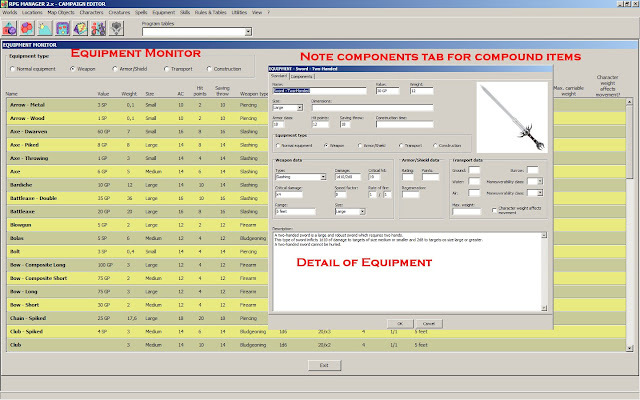 The Game Manager allows you to collate all the data you created in the Campaign Editor, and places it at your fingertips. One thing that shocked me was when I opened up my Isolde world in the Manager was that each hex has its own terrain, vision, and random encounters at the bottom. Move your mouse to a new hex and voila, instant feedback. 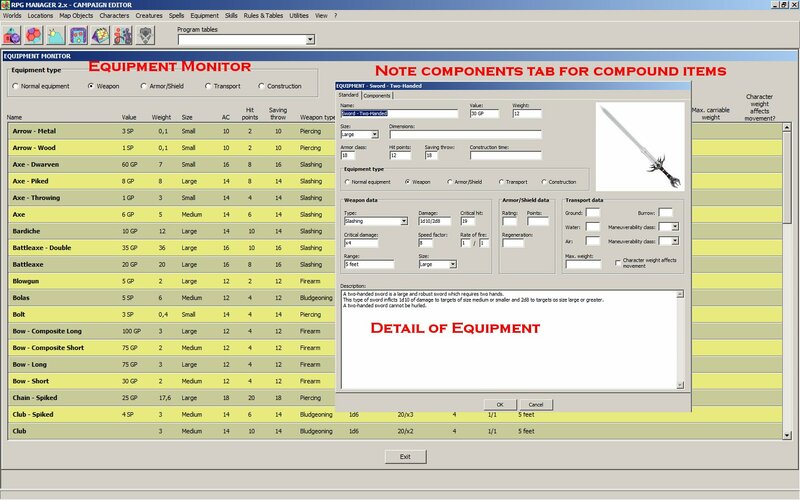 No more searching for charts covering terrain, vision, encounters etc. 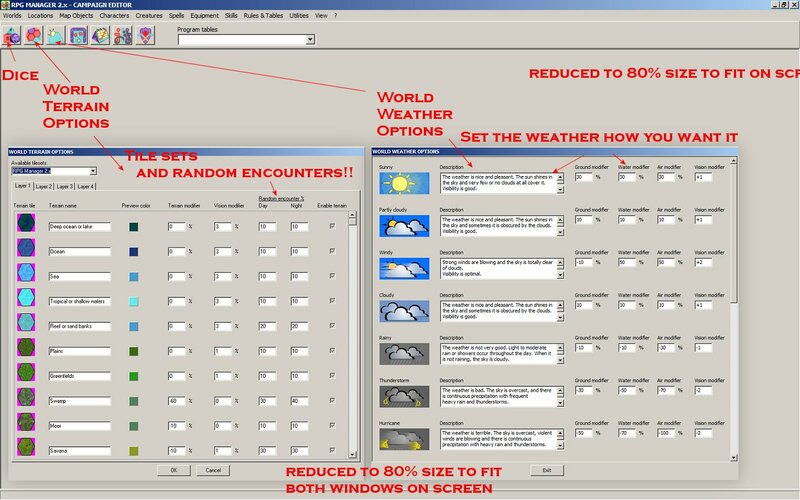 While I can't possibly cover everything this program has in this short review, the included screen shots should help shed some light on the features. Overall, this software has so many great features and best of all its still under development. The designer has put a ton of effort into this product, and while the first glance may lead you to believe its just another hex mapping program, what is hidden inside is as solid an entry into the DM Tool's field as I've ever encountered. I'll be following this product closely and urge you to do the same. Two thumbs way up! Very Interesting stuff. You've convinced me to add 1E/2E support to Qex. The trick to it is... what do you consider to be 1E support vs 1E compliant? Is it sufficient that the program simply be able to store the data? (eg rename Skills to proficiencies and use %) Or does it need to be "aware" of these rules too. This is important because the direction Qex is headed, a monster with +20 Climb will tend to climb if it can... so then this translates to "if 99% climb..."
You asked: The trick to it is... what do you consider to be 1E support vs 1E compliant? IMHO, a 1E compliant system includes all the various 1E rules built in and is where a DM can choose that rules system - from the possible multiple supported ones available in the software and be ready to run his game. Support of the 1E system at this point is quite honestly the way I see most newer software packages leaning - given its cheaper (from a license perspective), and less time consuming than to create an entire set of rules to cover every facet of the 1E system from scratch. I would use the analogy of Maptools and the idea of a "1E framework" that has all the rules in place making the DM (and players) life easier as a working example of compliance with the 1E gaming system. I've pretty much covered all of the various packages available to use as a DM's assistant in this series of posts. I still have a couple packages to review and post here and over at Dragon's Foot, and I still spend a few hours a week searching old archives, links, and then employing Wayback Machine when I discover any software that may fit the bill. So to answer your last question: Is it sufficient that the program simply be able to store the data? (eg rename Skills to proficiencies and use %) Or does it need to be "aware" of these rules too. While I'd be lying if I said 100% compliance isn't important to me, at this stage in the era of 1E, I'd be happy to see software that supports it - which allows DM's like myself to still use our preferred system for gaming - while closing off some of the more advanced skill sets that newer versions of AD&D/D&D 2.0/2.5/3.0/3.5/4.0 contain/use. Thank you for the very thoughtful questions and the kind words about this series of articles. I wish you the best of luck with your software. Aha, there's an important keyword you used there... "closing off" some portions of support. I understand from this... that a neat / good / awesome system would hide information a 1E DM should find irrelevant (eg feats). No problem... Just make some form templates - one for each edition. Next interesting question: You added Aerial Servant in the above example. While the adding process was painless, I think it fairly safe to assume that most DMs want their edition monsters to come already installed in their software package. You said: I understand from this... that a neat / good / awesome system would hide information a 1E DM should find irrelevant (eg feats). No problem... Just make some form templates - one for each edition. That is exactly the idea. In most current software packages for AD&D/D&D you can choose which "edition/framework" you want to start with, and all the rules are active and in place. Using D20 as an example, choose it in PCGen, and your framework is in place with everything you need to run your game. I'd say yes for sure, although the key for 1E is the AC is from -10 to +10, it is rather nice to open a program and know the monster with all of their stats is already there for use. Monster 2.1 which I reviewed in an earlier post, has every monster one could want, and is flexible enough to allow you to customize which sources the monsters are listed from. Want pure 1E?, turn off all sources except Fiend Folio, Monster Manual 1, and Monster Manual 2.